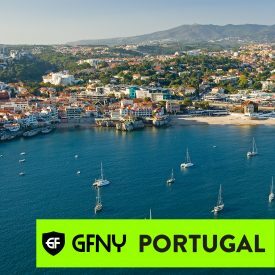 (NEW YORK CITY, September 5, 2018) – Cascais in Portugal will host the first ever GFNY Portugal on Sunday. Historical sites, palaces and fortresses of a bygone era will take riders on a journey through time amidst breathtaking landscapes. The race will start and finish from the beautiful Marina in the center of Cascais. Both distances (competitive 162Kms, 2469 meters climbing) and (non-competitive 82Kms) will follow a historical and challenging course towards Lisbon, returning to Estoril, passing the iconic racetrack. Riders will continue to Mafra towards the Atlantic Coast, passing through the villages coastal beaches of Azenhas do Mar and Praia das Maçãs. Athletes will face the force of nature when entering the Serra de Sintra, down Malveira to Cabo da Roca and when they meet the winds that blow from the sea on the edge of Guincho Beach, side by side with the wild dunes on the way back to Cascais and the finish line.